Now, SCPI has uncovered data from the CDC and the US Department of Education that show that use of the chickenpox vaccine is directly related to autism disorder prevalence in every state in the US. The graphs below show you this data. 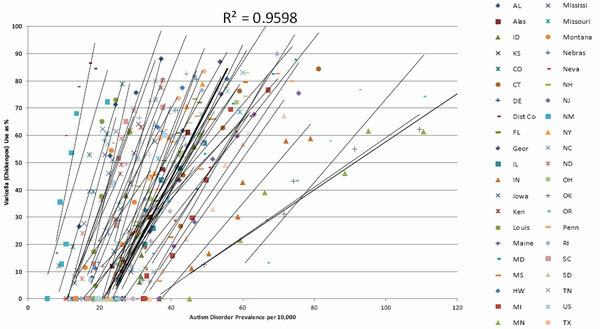 On the horizontal axis (the x axis) are the numbers of children diagnosed with autism disorder by the age of 8 who were born in 1992 through 1998 and on the vertical axis (the y axis) is the percent of children who were vaccinated against chickenpox for those same birth years. 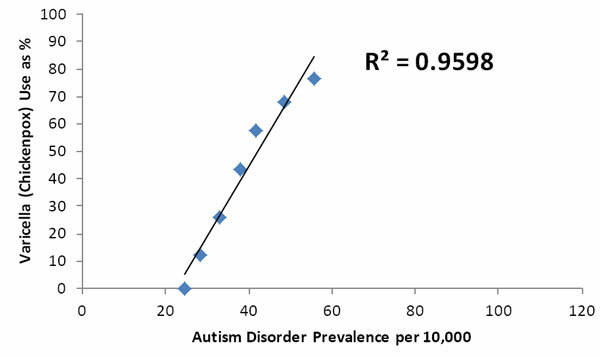 As you can see, as chickenpox vaccination rates increase, so do autism disorder diagnoses. The first graph is the average of all the US, and the second graph shows the same relationship state by state. US Autism Disorder Prevalence Compared to Varicella Use for Birth Years 1992 through 1998. What the graphs above show you is that in almost every state in the US, the use of chickenpox vaccine is directly related to the number of children diagnosed with autism disorder in each year during which chickenpox vaccine use rose from 0% until it reached its maximum use. I’ll say that again, for emphasis: as more and more children were vaccinated with the chickenpox vaccine, more and more children were diagnosed with autism disorder. Statistical analysis on the data for the entire US yields a correlation coefficient (R2) of 0.9598. For those of you who don’t understand statistics, an R2 of 0.9598 is very significant . Let’s put these results in perspective by looking at global warming for a minute. I love the environment, and I had been hugging trees for decades before global warming became the topic that it is today. The R2 for carbon dioxide levels compared to the earth’s temperature over the past 150 years is only 0.44. That’s right, an R2 of 0.44 has roused the public to become active and concerned about our environment. Shouldn’t an R2 of 0.9598 raise even more to action? What will you do with this information? Why was Sound Choice the organization to uncover this evidence from the CDC and the Dept of Education? Why don’t the CDC and the Dept of Education do this research and publish these results; results which should without a doubt lead to serious scrutiny and safety research into the cell sources that we use to manufacture vaccines for our children? We should all be asking these questions. In publicly available documents, for over 50 years experts at the FDA have debated the dangers of using aborted fetal cell lines to manufacture vaccines. Unfortunately for the public, in one document they are quoted as saying that they prefer to do ‘intuitive’ experiments. That means they preferred to talk about the potential dangers rather than doing the experiments that would have shown how dangerous using aborted fetal cell lines really was. Isn’t this incredible? 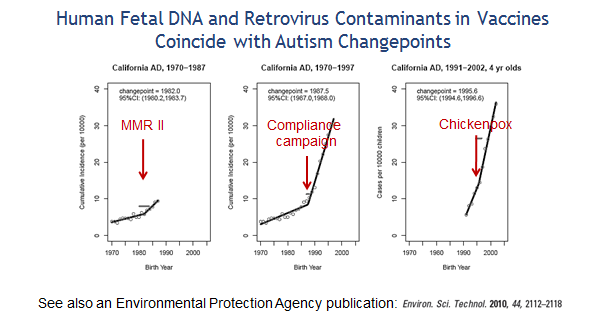 The FDA knows the potential danger of having fetal DNA and retroviruses contaminating our vaccines, the CDC has all the data on use of the chickenpox vaccine, and the US Department of Education has all the data on autism disorder prevalence. Yet, not one of these organizations seems to have ever looked to see how such an obvious potential trigger for autism disorder might be related to the epidemic levels of autism we are faced with. The CDC and the FDA are organizations whose duty it is to protect the health and safety of the public. Don’t they talk to each other? All I can say is thank you to those of you who have supported Sound Choice and made this research possible. We are working hard to get this new information into the hands of our elected officials and those organizations like the FDA and CDC who are charged with protecting the health of our children. We continue to rely on your support to make sure we have the means to get this information to those who need it. Don’t our children deserve the same love and care we all give to the environment? This entry was posted on Monday, October 1st, 2012 at 10:14 am	and is filed under News & Commentary. You can follow any responses to this entry through the RSS 2.0 feed. You can leave a response, or trackback from your own site.